The newly elected Tripura chief minister Biplab Deb has once again given a shot and managed to hit headlines with his controversial remarks and this time it's on Rabindranath Tagore. 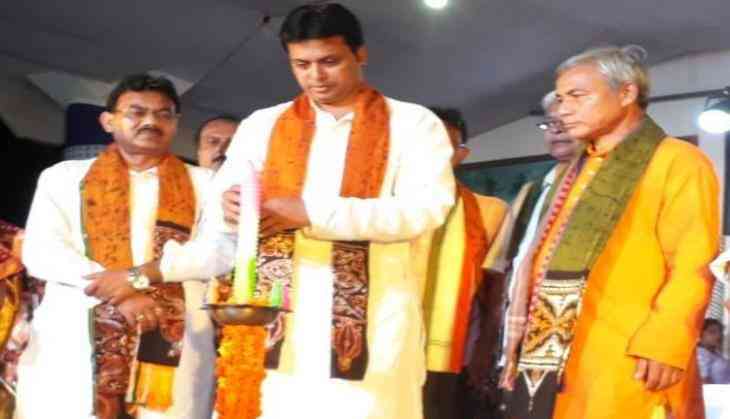 Biplab Deb earlier made a series of embarassing and controveesial comments from the internet during Mahabharata to the youngster to get self-employed by setting a paan shop or milk cow instead of running behind politicians for the job. While addressing public gathering organised to mark the 157th birth anniversary of the poet in Udaipur (Tripura), Deb apparently said Tagore “returned his Nobel Prize” to protest against the British rule. In no time a video of his speech went viral on social media. However, this is not the first time Tripura CM Deb has made a gaffe, his “ignorance” about Tagore and Nobel has baffled many. In 1913 Rabindranath Tagore had received the Nobel Prize for poetry and it was well documented. As per reports, Tagore's Nobel medallion, in fact, graced a museum at Shantiniketan until 2004, when it was allegedly stolen. The memorabilia was never found as the theft case, investigated by the CBI, was permanently closed in 2009 due to lack of progress. Even Tagore has nothing to do with the British as the Nobel Prizes in Physics, Chemistry, Physiology/Medicine and Literature are awarded by the Nobel Foundation in Stockholm, Sweden, as stipulated in the will of the Swedish-born inventor and international industrialist Alfred Nobel. Tagore never denied the Noble, in fact, what he refused was Knighthood, which the erstwhile British government wanted to give him. He refused to accept the honour in protest against the Jalianwalla Bagh massacre of 1919. Earlier last month, Biplab Deb made a shocking statement by stating that “Internet and satellite communication existed during the Mahabharata era”. He later pointed out the 1997 Miss World Diana Hayden remarking that she did not deserve the title as she was “not an Indian beauty”, and praised Aishwarya Rai as the “true representative of Indian women”. In yet another bizarre remark, Deb said mechanical engineers should not opt for civil services, but civil engineers should and suggested to the youth that in spite running behind politicians for jobs, they should set a paan stall or milk cow. After making rows by his bizarre statement, Deb had also threatened to chop off nails of people if they interfere in his government or poke their nose in his governance.